1 of your 5 a day. Easy to make. Preheat the oven to 220°C, gas mark 7. 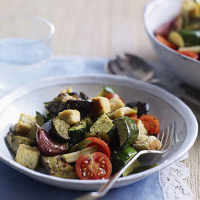 Cut the aubergine and courgettes into large cubes and toss with the salad onions, the whole garlic cloves, half the oil and seasoning. Place in a roasting tin and bake in the oven for 30–35 minutes until slightly charred, stirring halfway through cooking. Whisk together the vinegar and remaining oil and stir into the roasted vegetables with the tomatoes and croutons. Transfer to a serving bowl and leave to stand for 10 minutes before serving. Instead of the croutons,use up leftover ciabatta. Tear a day old Waitrose Half Ciabatta into large pieces and place on a baking tray. Bake alongside the roasting vegetables for 10 minutes, until golden, then toss with the vegetables when you add the tomatoes.